Maha Shivrathri in February-March; Aaipasi Annabishekam and Skanda Sashti in October-November; and Tirukarthikai in November-December are the festivals celebrated in the temple. This is the birth and salvation land of Ilayankudi Maranar, one of the 63 worshipful Saivite Nayanmars. 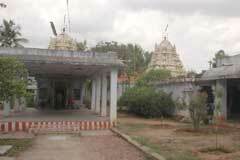 The temple is open from 6.00 a.m. to 11.00 a.m. and from 4.30 p.m. to 8.30 p.m.
Sri Rajendra Chozheeswarar Temple, Ilayankudi-630 702. Sivaganga district. +91- 4564 - 268 544, +91- 98651 58374. 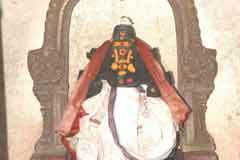 Lord Venkatachalapathi graces from a shrine behind that of Lord Shiva. 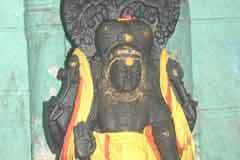 Lord Dakshinamoorthy in the goshta wall appears with only two disciples. There are shrines for Lords Mahaganapathi, Muruga with His consorts Valli and Deivanai, Navagrahas the nine planets, Sani Bhagwan, Sun and Moon in the prakara. People pray here for food security and to cultivate in them the traits of being selfless and helpful to society. 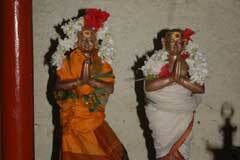 Devotees offer rice nivedhana to Lord and Annadhana to visitors. 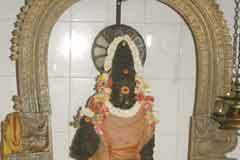 Saint Ilayankudi Maranar has a shrine in the temple. He was praised by the people as Annadhana Prabhu. 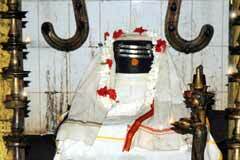 His service to Lord Shiva was through this service to society. He is praised as Healer of Hunger. Mara Nayanar and his wife Punithavathi come in procession in the same Chapparam along with Lord and Mother on Guru Puja day. This is an important event in the temple. Palak with stems – Thandu Keerai in Tamil, is offered as nivedhana to Lord. Maranar’s home and the land he cultivated are near the temple. His land is praised as “Mulai Vari Amudhu Alitha Nattrangal” meaning, the land that produced rice for nivedhana to Lord. As Nayanar attained salvation through his Annadhanam service, people follow this nivedhana practice as a prayer commitment. There are separate entrances for the shrines for Lord, Mother Gnanambika and Lord Muruga. 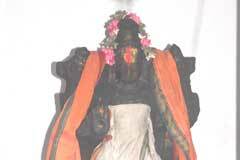 Mother Gnanambika blessing devotees with wisdom is south of Lord Shiva. Those aspiring excellence in education and academic pursuits pray in Mother’s shrine. 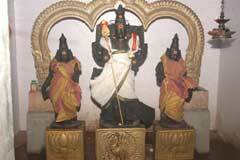 Lord Muruga is in Shiva shrine front mandap without Mother Valli. 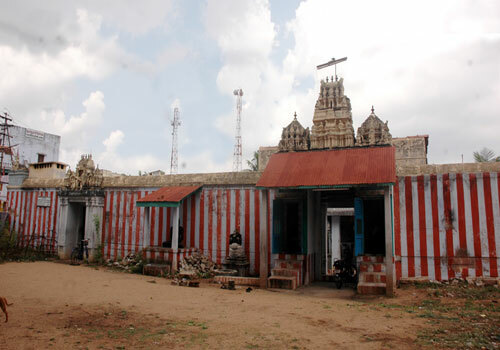 As Indira installed the Shivalinga and worshipped here, it is said that his daughter Deivanai alone is with Lord Muruga. In order to be freed from the curse of a sage, Indira came to earth, installed Shiva Lingas in many places including this place for his worship. In order to test the Annadhana pledge of Ilayankudi Maranar, Lord made him poor but Nayanar continued his undertaking with a strong will. Lord visited his house one night. Though Nayanar had nothing to offer the guest, undeterred, went to the field, brought the paddy grown that day. His wife dried the wet paddy, made rice, cooked it with Palak and offered it to Lord Guest. Pleased with Maranar’s commitment and determination, Lord granted salvation to him and enthroned him as one among the Nayanars. 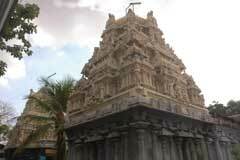 Lord is gracing in this temple as Rajendra Chozheeswarar blessing His devotees. Ilayankudi is 10 km from Paramakudi on Karaikudi Road. The temple is close to bus stop.